Another stunning Edwardian era hat. This one in deep red has a layer of black dotted net. It is oversized,with tall crown, and wide downturned brim. 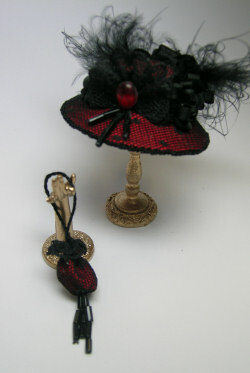 It is trimmed with black lace, feathers and bugle beads. There is a darling matching drawstring bag from the same fabrics with a little beaded tassel at the bottom . Download is in PDF format. It contains complete instructions with dozens of photos, full size pattern pieces for the hat and all techniques to create the silk bag.